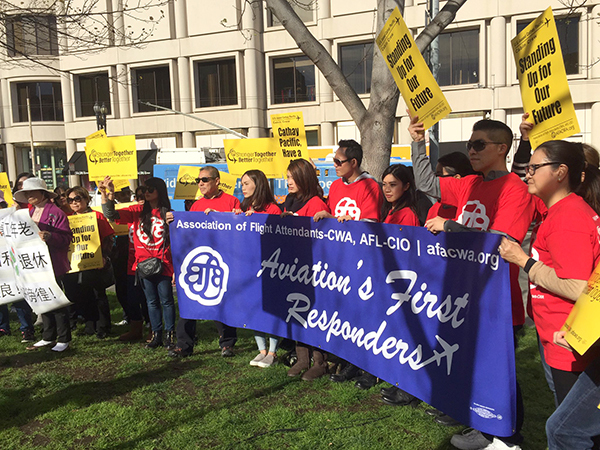 U.S. Cathay Pacific Airways Cabin Crew, supported by AFA-CWA, Bay Area labor, and allies, rallied in front of Cathay Pacific U.S. corporate offices this week. The public demonstration aimed to pressure the airline to ensure U.S. employees have access to Social Security and Medicare. Cathay Pacific Airways in September made a unilateral decision to stop paying payroll taxes for U.S. Flight Attendants – permanently denying them Social Security and Medicare benefits. "Cathay Pacific Airways has a moral obligation to keep its promise to employees they chose to hire in the U.S. Their foreign company scheme to deny U.S. worker rights sets a dangerous precedent and threatens our families and communities. Cathay Pacific must reverse course and play by the rules. It is unacceptable for Cathay Pacific to try to increase corporate profits on the backs of U.S. workers," said Sara Nelson, AFA International President. U.S.-based Cathay Pacific Flight Attendants will vote on AFA-CWA representation this month. U.S. Cathay Pacific Airways Cabin Crew, supported by AFA-CWA, rallied in front of Cathay Pacific U.S. corporate offices this week to tell the company to pay U.S. Flight Attendants' Social Security and Medicare benefits.